Owners of a Swiss edu-ID can now link their ORCID iD (Open Researcher and Contributor ID) to their Swiss edu-ID profile. Go to your Swiss edu-ID profile and link your ORCID iD now. The ORCID iD is imported to the Swiss edu-ID profile in a secure way making sure that only the owner of the ORCID iD can import it, and that the iD can’t be tampered with. Individuals who do not yet have an ORCID iD can create one on the fly and link it to their Swiss edu-ID. 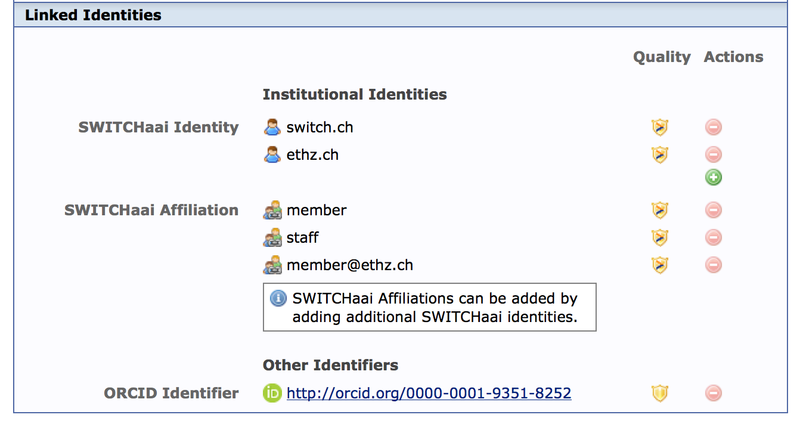 Once the ORCID iD is linked to a Swiss edu-ID account, it is available to services in the attribute eduPersonOrcid. This greatly helps services to include the ORCID iD in their business workflows and likewise enhances the benefit for scientific authors. About ORCID: ORCID (Open Researcher and Contributor ID) is a nonproprietary code to uniquely identify scientific and academic authors. It is operated by the non profit organization orcid.org. Individuals can include their ORCID identifier on their web page, in their publications, when they apply for grants, and in any research workflow to ensure they get credit for their work. See also Swiss edu-ID ORCID working group report.